I am going to be starting graduate school at the University of Tennessee this fall (in about a month). I’ll be going for an MFA in printmaking. Tennessee was definitely my top choice in school and it has a very close knit printmaking group. The school has a total of 9 print grad students and they accept 3 new incoming grads each year. Despite being a very small program UTK printmaking is ranked 4th in the country. And they have this amazing etching press with a press-bed that is literally 5 feet by 10 feet. This is all very exciting and nerve wracking. I managed to get a work study job in the University letterpress studio. This was a stroke of good fortune for me because I have letterpress experience so my new professors recommended me for it. Which has great pay, only requires 10 hrs a week and it literally in the same building as all of my classes/studio, oh and it’s an experience that I can put on my resume! 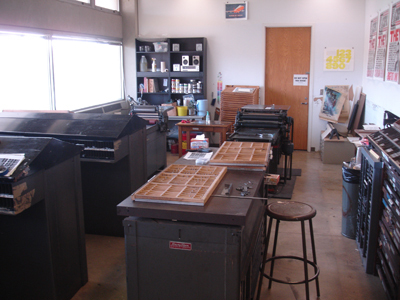 Here is a picture of the letterpress shop. The have managed to fit quite a lot into a rather small room. I have found a room in a sweet little shared house. Just South of Knoxville and across the Tennessee river. I’ll post some pictures of it as soon as I can. This was written by Hannah. Posted on Monday, July 11, 2011, at 10:25 AM. Filed under Art, Life. Tagged graduate school, letterpress, printmaking, Tennessee. Bookmark the permalink. Follow comments here with the RSS feed. Post a comment or leave a trackback. Congratullations Hannah. My youngest son will be attending U of Tennessee this fall as a foreign student. We will drive there from Mexico in August. I did not know they had a good printmaking program. Congratulations Hannah! Have a wonderful time at UT and wring every bit of experience you can from it. To have access to that press would be a dream come true. Hey Hannah! I need your new Tennessee address so I can write you letters like the old lady that I am. Just send it to my email: oddrid at gmail dot com. That looks like such a happy little room! I can’t wait to come visit!